Renoir was a leading artist in the development of the Impressionist Art movement. He is known as a painter of people and of social life. Pierre-Auguste Renoir was born in Limogues, France in 1841 into a working class background. When he was four his family moved to Paris where he grew up. At 13 he became an apprentice porcelain painter in a factory in Paris. During these early years he often visited the Louvre to study at first hand the works of the old masters. In particular his favourites were the French painters; Delacroix, Boucher and Fragonard. In 1862, Renoir joined the art school of Charles Gleyre where he met with fellow students Claude Monet, Alfred Sisley and Frederic Bazille. 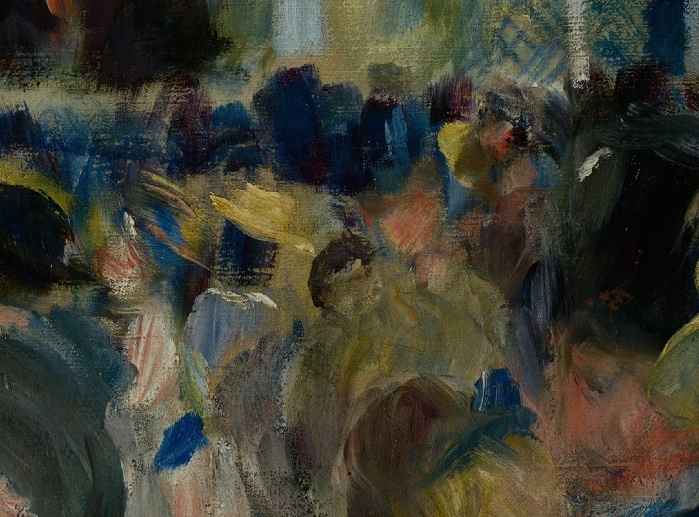 Through these new friendships he met with other artists Edgar Degas and Edouard Manet. This group of Artists spent much time together during the 1860’s discussing and sharing their ideas on Art. It was out of this group that Impressionism developed. The first paintings that are attributed to being “Impressionist” in their outlook were painted by Renoir and Monet during the summer of 1869.
ings at the Salon for their exhibitions but failed to get selected. In 1874 he took part in and was one of the chief organizers of the first Impressionist Exhibition. Renoir continued to be involved in the second and third Impressionists exhibition but he was the first of the Impressionist group to break away from its style of painting and also the first to return to exhibiting his work at the Salon. During the early years Renoir struggled for acceptance from the establishment and consequently times were difficult financially. He was the only painter of the Impressionists who came from a working class background. 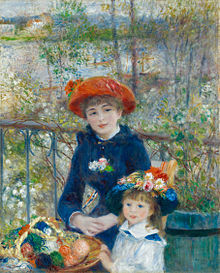 Gradually though, over the years, Renoir gained in reputation and his work began to be bought increasingly by collectors. By the end of his life in 1919, Renoir enjoyed a great deal of wealth and fame throughout France and internationally. In the year of his death in 1919, he was able to visit his own paintings hanging in the Louvre beside the old masters whom he so admired. 3) Its a snapshot – photographic like in that a fleeting moment is captured and figures are cut-off in the frame. a foreground containing a group of figures who are mostly seated and who are engaging with each other -to the left a child and her mother sit, the mother is cut-off by the edge of the paining. )In the middleground the figures appear to be either dancing or gazing out to the right of the pictures a a scene that is cut-off from our view. 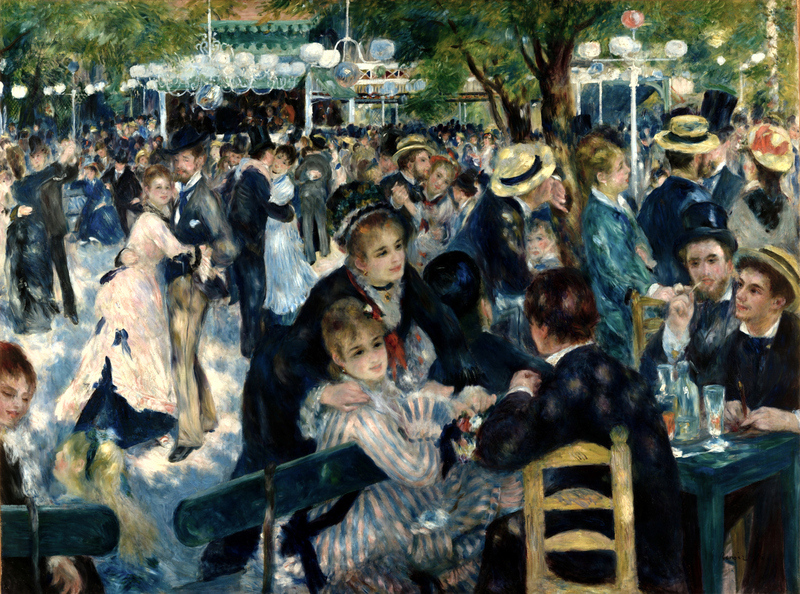 In the background, Renoir manages to fit in scores of people who appear very small in the distance but who are dancing or socializing. 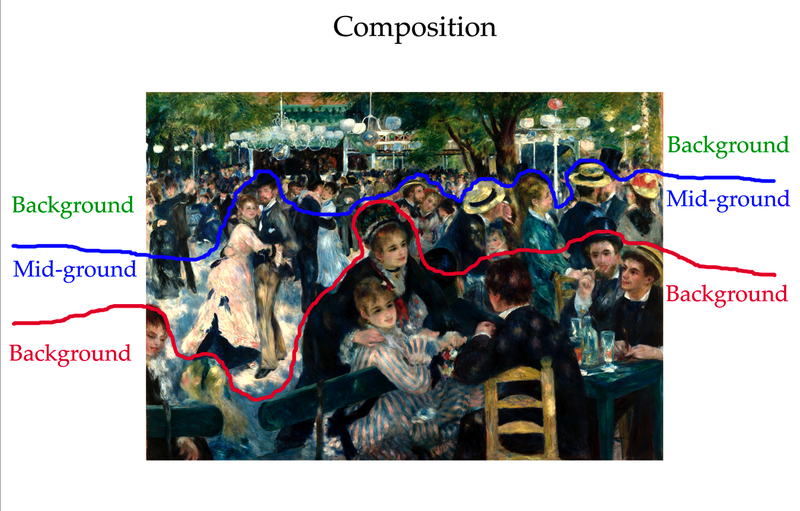 This composition has been clevely designed by Renoir to keep our eye moving from one scene or zone to another ranging from the fore to the background. Our eyes are unable to settle on one scene. In Bal du Mouln de la Galette Renoir gives us the impression that the scene before us is taking place on a sunny day beneath the dappled shade of trees. 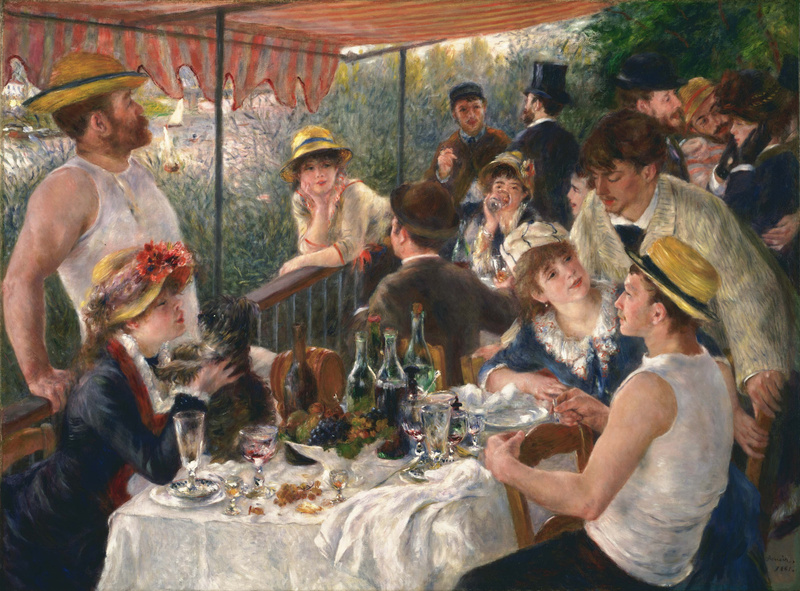 Renoir paints glimpses of sunlight as spots on the figures – as seen most clearly on the figure of the young man in the foreground with his back to us. Renoir also paints dappled shade on the ground appearing as dark spots. 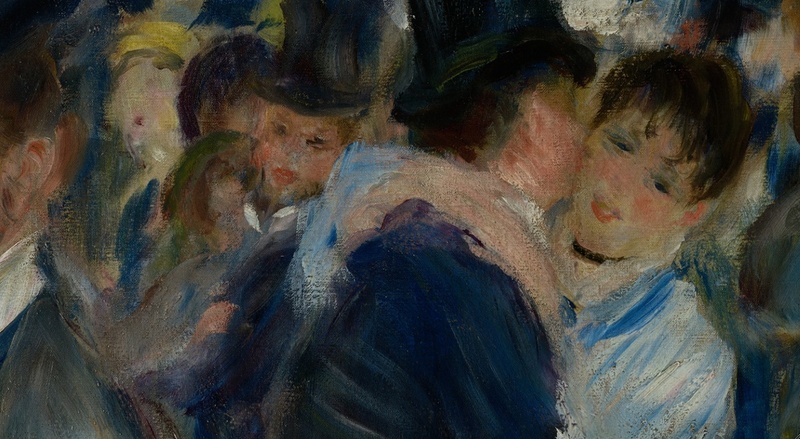 Renoir uses very loose brushstrokes in Bal du Moulin de la Galette. This loose treatment gives the impression of movement. In the foreground he paints the details in a more defined and smoother way. As the painting recedes the brushstrokes become looser and the figures are less defined; details like features of the face and jewellery become lost at the back. Renoir paints the rough shapes of hats and dresses to indicate that the blobs of paint and colour are people. 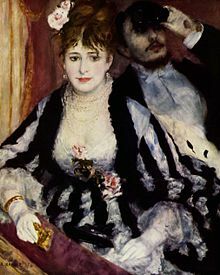 In the middle-ground Renoir begins to paint in broader strokes where details become lost – the eyes are reduced to being slits, the hands of the woman are painted so loosely the individual fingers are obliterated. Compare this to the foreground details above. In the background Renoir works very loosely depicting individual figures with just a few brush stokes. We can make out the shapes of hats and dresses but very little else of details. There are barely faces to be seen and no features on the faces. 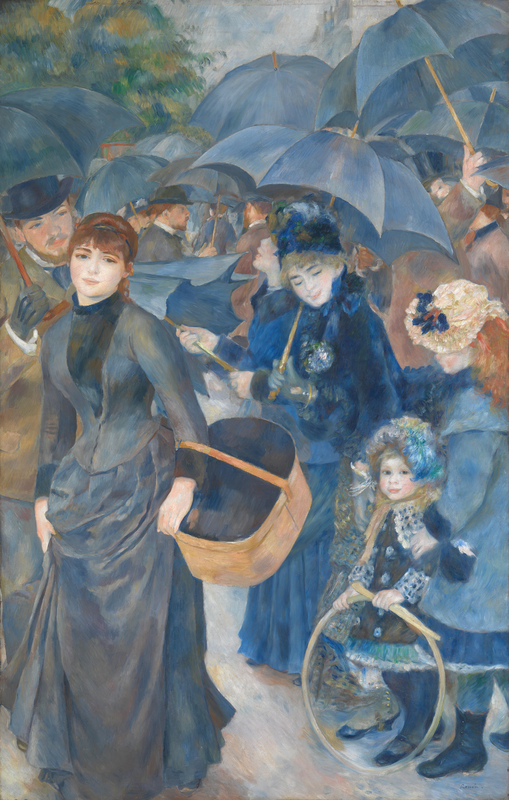 In The Umbrellas, Renoir show us once more how skillful he is at painting large groups of people. This painting depicts a busy street scene in Paris with most of the people using umbrellas. On the left a young woman holds up her skirt to avoid splatters of mud. Behind her a young man seems to want to engage her but she appears unaware of him. On the right a mother glances down at her two daughters, both of whom are fashionably dressed. Behind her is a woman caught in the act of either raising of lowering her umbrella. 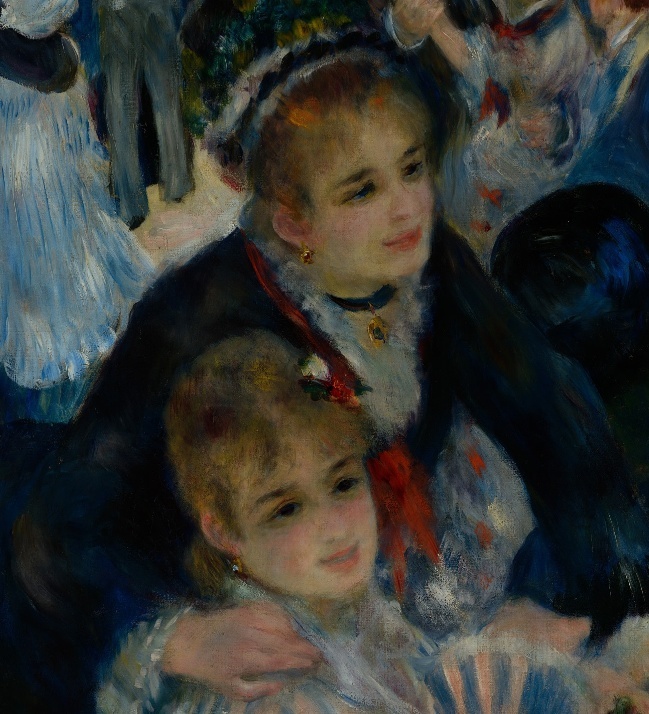 This painting shows Renoir’s transition from one style into another. The two girls and their mother on the right are painted in a loose textured style while in contrast the woman on the left and indeed the rest of the piece is painted more smoothly, with modelling and with strong outlines in places – in particular the umbrellas. It is believed that this painting was started by Renoir in 1882 and that he ceased to complete the piece until a number of years had passed during which time he had changed his style from Impressionism to a much more solid manner. This painting was completed in 1886 and was owned by Sir Hugh Lane. It was bequeathed by him to the National Gallery in London but is regularly exhibited at the Hugh Lane Gallery in Dublin.